The menopause transition, which typically occurs in a woman's 40s or 50s, can bring with it unpleasant symptoms that lower quality of life. Although menopause is not a disease and does not need to be treated, the symptoms can be managed if they greatly interfere with daily life. With the possible risks of conventional hormone replacement therapy, some women opt for non-pharmaceutical treatment methods for their menopause symptoms. 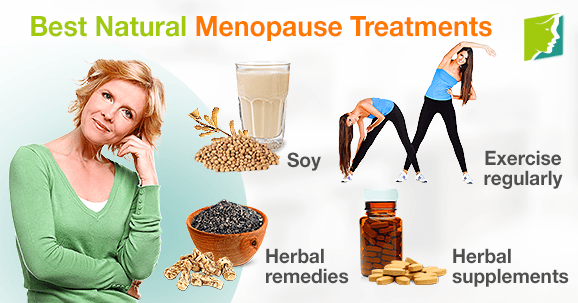 How Can I Ease My Menopause Symptoms Naturally? Whether you add something new to your routine or omit a previous habit, some natural treatments can help manage menopause symptoms. Coffee is the main one, but tea, soda, and chocolate are also sources of caffeine. Menopausal women are often plagued by symptoms like night sweats and sleeplessness, which can result in fatigue and added stress. Consuming caffeine in the late evening can interfere with sleep patterns and increase the risk of night sweats. Therefore, caffeine consumption should be moderated during the menopause transition. Incorporating soy into your diet may be a possible solution to menopause problems because soy contains phytoestrogens, in addition to being a good source of protein, calcium, and omega-3 fatty acids. It's important to limit the amount of soy that you eat or drink and not to use soy for long-term menopausal relief. Soy products include soymilk, tofu, tempeh, and edamame. Regular exercise can also have a positive effect on the functioning of the body. Working out for 30 minutes a day, five days a week can lower your risk of heart disease, diabetes, and weight gain. Weight-bearing activities will also help to ward off osteoporosis. Exercising releases serotonin and endorphins, neurotransmitters that chase away stress and anxiety and leave you feeling happy. Herbal remedies to relieve the symptoms of menopause come in several varieties, usually categorized according to how they function. Phytoestrogenic herbs like black cohosh and dong quai are so named because they introduce a plant version of the hormone estrogen into the body. However, it's important to be cautious with phytoestrogenic herbs. While they can solve the problem of low estrogen levels for most women, it is thought that taking these herbs for an extended period of time can also render the body less able to produce its own estrogen. Because phytoestrogenic herbs can only be taken for short-term relief, hormone-regulating herbs like Macafem are preferred by some women. This type of herb encourages the body to produce more of its own estrogen and other hormones naturally thanks to its beneficial nutrients. Herbs that nourish the body's endocrine system are a safe way to treat menopause symptoms. Although natural treatments may be beneficial, it's important to maintain a good relationship with your doctor, especially during menopause. Make regular appointments with your physician to receive a proper diagnosis, ask for treatment recommendations, and monitor your progress through the menopause transition.